1. UK Baseball took Game 1 in Gainesville, can clinch tonight. 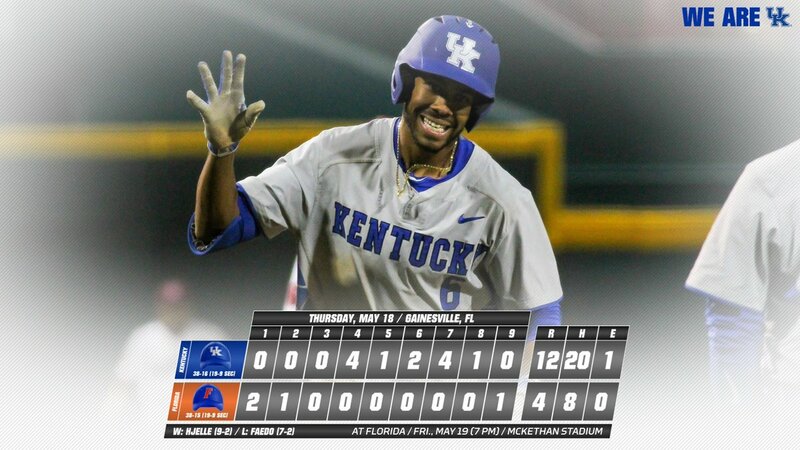 Playing for a nationally televised audience on ESPN last night, the Kentucky baseball team whooped the fifth-ranked Florida Gators, 12-4, against one of the SEC’s best pitchers. Tristan Pompey’s fourth inning grand slam got it going and the Cats never looked back in the series-opening win. Now the club is tied for first in the conference and can clinch the crown tonight in the second game of the series in Gainesville, which will get started tonight at 7 pm and will air on the SEC Network. 2. UK Softball hosts opening round NCAA tournament game today. On the other diamond, the UK softball team plays hosts to DePaul this afternoon in Lexington as the No. 14 overall seed in the tournament. Illinois and Marshall are also in Lexington to decide which team will advance to the Super Regionals via the double-elimination round. Today’s game is set for 2:30 pm and you’ll have to log in to ESPN 3 to catch the action. 3. John Calipari announced the signing of three new Wildcats. The paperwork is in and approved for the three spring additions to next year’s basketball roster. Of course I am talking about Kevin Knox, Jarred Vanderbilt and Jemarl Baker, who Coach Cal spoke about in length in a video to announce their signings Thursday afternoon. Kentucky’s final 2017 class has seven members, although the roster will not be complete until we learn the futures of Hamidou Diallo and Pitt transfer Cam Johnson. 4. Hamidou Diallo rumored to be doing his deciding today. We may not know what Hamidou Diallo decides for his future today, but word on the street is he has today circled on his calendar as the day he will sit down and figure it out. Matt said earlier this week that he now thinks there is a 60 percent chance Diallo returns to school; I can’t put a number on my opinion, but I do think yesterday’s meeting with the Brooklyn Nets will be the deciding factor. If Brooklyn assured him they will pick him with one of their two late first round picks, I think the kid’s gotta go and try to be the hometown star. If it were me, I’d take playing in my own city (New York) over coming back to college and trying to improve my stock. But who knows what Brooklyn told him; I guess we’ll find out soon enough. 5. Curveball for Cam Johnson. North Carolina has jumped in the Cam Johnson sweepstakes, but there’s one small caveat in Johnson’s release from Pitt that will likely keep UNC out of the hunt. Johnson will have to sit out a year if he transfers to another ACC school, per the release from Pitt. Any other conference and he can play immediately, therefore you gotta think the Tar Heels are behind Arizona, UCLA, Kentucky, etc. in the fight. The latest details of Cornell’s death make the story much, much sadder. 7. Are you ready for the Preakness tomorrow? Confession: I’m terrible at betting the ponies and I know very little about tomorrow’s race. So maybe we’ll do a preview of it a little later today. It’s a Friday and I have the site all day — what else do we have to do? 8. Listen to Kirk Herbstreit’s interview with KSR. 9. Ryan Lemond to host KSR today while Matt Jones in on a bachelor party. The proverbial wheels are about to proverbial fall off in the Lexington studio this morning. I would help him out, but I am also out of town, so I think he called in the lefty to help him out for the two hours. Either way, prayers for KSR radio. 10. Oh yeah, almost forgot… No Bamba. Mohambed Bamba picked Texas yesterday, in case you hadn’t heard. You can read my instant thoughts on the surprise decision here. Just to clarify since LSU won last night, if they sweep MSU this weekend the Cats needs to sweep Florida too I think. I don’t think a win tonight clinches the regular season championship, but it could with an LSU lose in either of their last 2 games. Or my math could be wrong, after all it is early. Are they going to drag fans out of their seats? That is one stadium you definitely don’t want to get ejected from! Kroger has better food than UA. I am still in mourning over Chris Cornell’s death. Word is circulating that he was on anti-anxiety medication that can cause suicidal thoughts, and he took a couple of them after the show. Chris who? Chris who cares.